Cards have become the biggest innovation into the financial market. People cannot think of stepping out of their houses without their plastic money. It has become a lifeline for all and it has a lot of benefits as compared to cash transactions. This does not mean that cash is not the right mode of financial exchange. However, plastic money has got many faces which helps it to make the individuals use it to the core. Let us look at the various types of cards available in the market. Cards are of many types and all have different uses. If they had the same usage, then their existence would be of no use to us. Let us deep dive into different cards. Credit card is a form of plastic money. It is issued by the banks and financial institutions with a credit limit set as per the individual and the documentation done. The limit can be endless here if the person has the capability to repay. This credit has a fixed period upon which a bill is generated and is passed on to the card holder to make a payment by the due date. This payment should be adhered on time else the credit history may be affected which could cause you dearly in the future. This is majorly used by all, as it has a good rolling period capacity. It can be used at all merchant and outlets that accept credit card. Credit card offers a lot of benefits to the card holders and it is used by almost everyone to the core. In a credit card, you can also withdraw cash just like a debit card, but it is also deducted from your credit limit. However, there is a separate cash limit in a credit card which cannot be exceeded and the interest on such cards is also very high as compared to any other interest on any cards issued in the market. Therefore, you should be careful while using such facility given by the bank. Debit card is a bank card or a cash card. It is linked to your account savings or current and is issued by banks or financial institutions. Such cards can be swiped at all major outlets and merchants that accept debit cards. You can pay utility bills, shopping bills, buy services, withdraw cash and much more. All such transactions are deducted from your bank account linked with the card. It would be difficult to shop with such a card if there is no balance or limited balance as compared to the swipe amount. Therefore, it is not majorly used by people who do not wish to get stuck if no balance is available. A charge card is a payment card issued by a limited number of card issuers. This card is just like the credit card as it is not linked to any account, but the card issuer makes payments to all the expenses made on such cards. The only condition is that the payment for the bill amount should be done at one go without any balance outstanding. Such cards are issued with some trust imbibed in the card holder and can be used at any outlets where cards are accepted. This card is issued to the card holder to withdraw money from an Automated Teller Machine (ATM). It is not like a debit card where you can swipe it at any machine to make a transaction. It is not powered by visa and mastercard for transactions other than ATM swipes. It is a single usage card where you can only use it to withdraw cash. It is helpful for people who do not have any other usage for cards apart from withdrawing cash. A stored-value card is not like a debit or a credit card. It is a self-usage card where the amount is topped up in the card and can be deducted at any place where you swipe it. It can be used across the globe for any transaction and has an equal value of a credit card and a debit card. But the only difference in such a stored value card when compared to debit and credit card is that it does not debit any account linked to the card and neither does it lower the limit set by the card issuer like it does in the credit card. The amount you fill up in a stored-value card can be used in full and then the card can be destroyed or topped up again to enjoy the benefits until the amount is over. You can also call it as a prepaid card or a gift card. The other difference it has as compared to the credit and debit card is that it is not named on the card holder and is anonymous. It can be used by anyone who has it without any questions asked. This can be a benefit or a risk as well. Fleet cards are fixed expense cards majorly used by companies and organizations where vehicles are used on regular basis. Such cards are used by the employees of the company to swipe and use it for petrol and diesel expenses and for any repair or maintenance uses. It is used at fixed pumps and service stations so that it can be accounted for. They are used so that the employees need not use cash for any sort or regular expenses and it can be directly paid by the company to the service station or the pumps. In short it is to reduce the cash handling transactions and maintain the safety and reduce the risk factor to keep the business running as usual. It is a great way to keep the administration expenses under control and scrutiny. When an employee is hired, they have many expenses which are borne by the company and it becomes difficult to maintain and account for all such transactions. It can also be mixed with some personal expenses. This fleet card helps the employees sort the personal and business expenses. Payment cards are also one type of card which is basically used for any kind of payments. It is not used for any kind of cash transaction such as ATM withdrawals. These cards are not so popular among the individuals as it can also do the same thing as any other card. Some of these cards are also issued by the banks and financial institutions and are still called as credit and debit cards. Each card has its own special meaning and the benefits of using a card are many and one should not hesitate to use them. Let us look at them in detail. There are many cash back offers rolled out by the card issuing company or institution. These should be used to the core as it can help you get the deal in a discounted price. These cards can be credit cards or debits cards and you may even get a cash back offer for buying groceries at a special outlet or online as well. These can be on travel bookings or movie bookings or anything at all. Reward points are majorly a part of the credit card offers. It provides some points on the card usage which can then be used for any purchase such as vouchers and gifts. You can also make payments for your statements if the card issuer allows the same. Cards offer a huge amount of safety from carrying chunks of cash at all places. Cash can be at huge risk of being lost or theft but card is safe technologically. You can swipe it at any point in time and use your pin or verification codes to complete the transaction. How do you apply for any of the above cards? You can apply for any of the above cards using the card issuing centers or the official online portals. You can do so using your laptop system or your smart phones as well. The process is easy and simple. All you need to do is fill up the form with your relevant details and submit the documents. The back-end team would then scrutinize the documents and gage if the card can be issued to you or not. Once the documents are scrutinized, they would issue you the card. This card can then be used for all financial transactions with the help of the PIN. This PIN verification is your identity that the card belongs to you can cannot be used by anyone else unless they have this PIN. Therefore, you should keep such PIN and sensitive information safely under your custody. It should be some numbers and words that are common for you but difficult for others to guess. Q. What are the Payment Cards? A. Payment cards are a huge part if the financial system. They are used for all sorts of payments and are issued by banks and financial institutions. You can do almost every financial transaction with such cards. Q. How many types of card are there? A. There are many types of cards. You can use any of them to meet your financial requirements. Each card has a different meaning and charges which you should be aware about. Listed below are a few card types. Q. How do bank cards work? A. Bank cards work in a simple manner. You should just swipe the card at any merchant outlet and get it paid by the many modes available. If it is a debit card then the payment would be done by the account it is linked to, and if the card is a credit card, then you can make the payment as and when the statement is generated. Q. 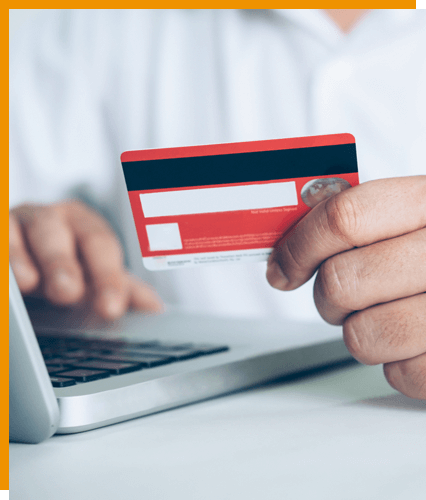 How to make online payment by card securely? A. Online methods are used by all individuals and it is considered as the safest. You can use an online mode to make a payment for your card safely and in a secure manner. You need not worry about any fraudulent activity done on your card or account if you use the right gateway for it. Q. What does a visa/Master credit card do? A. A visa credit card/Master credit card is powered by Visa/Master as a company. These are payment processing companies and are globally recognized. Such companies ensure that all the transactions reach the vendor and the merchant safely. Almost every card transaction passes through this company so that the authentication can be gaged and managed. Banks and financial institutions issue various types of cards to its customers so that they can use it to increase their business. Each card that is issued to the customer is charged and has some fees added to it. These charges and fees are different for different cards. It can be levied as and when the card is issued to you or on timely basis. As a customer, you should know about such charges and fees. It can get difficult to reverse such charges and can be a huge cost for the card user. There are many cards that are free for lifetime and can be used without much difficulty. If you have such options available, then why should you use cards that are charged on annual basis or may be early as well? However, such cards that are chargeable have many benefits attached to them as well. These benefits shall be helpful to the card holders if they know about it in detail. So, always be informative about such cards so that you can use the benefits attached to it to the core. It is easy to get cards issued and you can use them for almost anything as they are all linked to the internet.